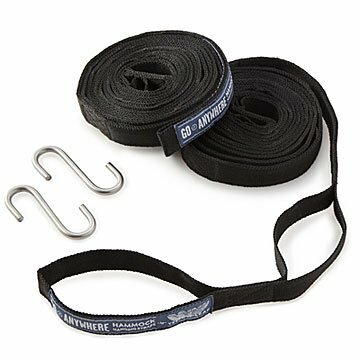 Use these tough, handy hangers to take your hammock on the go without damaging trees. Use these handy hangers to move your swinging oasis from back yard to campground without damaging trees. The super-strong mesh bands are easier on them than ordinary rope (or worse, harsh hardware), and let you hook to trunks from 9 to 30 feet apart. Each set supports Yellow Leaf Hammock's efforts to build economic opportunities for women in impoverished communities. Handmade by artisans in Thailand. To use: Wrap a strap securely around each support point (thread the end strap through the appropriate loop, depending on the length of strap you require) and connect the eyes of the hammock to the pre-made attachment points using the included S-hooks.